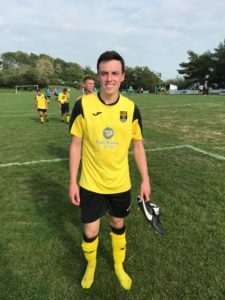 LYME Regis 1st team chalked up an early season double at the Davey Fort this afternoon (Saturday) when they beat near rivals Seaton Town in a comprehensive 5-1 victory. 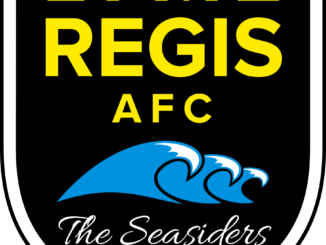 Lyme and Seaton met in the first week of the season when the Seasiders ran out 3-1 winners at the East Devon club. Lyme were without seven first team squad members, due to holidays, injuries and unavailability, resulting in the cancellation of their Reserves’ game at Black Swan Town and on occasions are notorious slow starters. This was one of those occasions and Seaton had the better of the chances early in the game and opened the scoring with a Josh French penalty in the 17th minute, awarded for a trip by Kingsley Wellman. The Seasiders, lacking penetration up front, slowly got themselves into the game with Fred Parsons and Cody Bowditch both having efforts kicked off the goal line. Lyme got back on equal terms when Ben Turner converted a perfect Sam Beviss cross with a header to level the scores at 1-1 after good work down the left by Cody Bowditch. Cam Fowler was booked for a trip on the edge of the box but the free-kick was blasted over the bar. Lyme took the lead in the 37th minute and again it was Turner who headed home a penetrating cross from Jake Bearpark to make it 2-1. Turner was clearly looking for his hat-trick but was booked for a deliberate handball as he threw himself at the ball from another Beviss cross. Manager Gerard Hitchcock changed things around at half-time and put Jake Bearpark upfront to lead the attack. It was a move that changed the game and inspired Lyme to lift their game with three more second half goals and numerous near misses. Bearpark had never played in such a forward role before but his pace caused the Seaton defence major problems and delivered two more goals for the home team, the first when Bearpark latched onto a perfect through ball from midfield maestro Mark Bailey and placed the ball wide of the keeper to put the Seasiders in a commanding 3-1 lead. Ben Turner, already on a yellow card, was substituted in the 62nd minute after being spoken to the referee and was replaced by new signing Joe Urquart, a former Axminster Town player, who will shortly be taking up a place at Glasgow University. Urquart added some much-needed pace to the Lyme attack but, alas, will not be available all season for Lyme. Bearpark had the ball in the net again after 65 minutes but was ruled offside and shortly afterwards Mark Bailey hit the bar with a fierce free kick from just outside the box. In a rare second half attack from Seaton, Kingsley Wellman, who had another immense game in the back four alongside the experienced Gary Knight, whose presence always stimulates the younger players, cleared the ball of the line. Bearpark went close with another penetrating run and Cody Bowditch hit the post after some good work down the right by Spanish signing Jaime Roderiguez. Bearpark was rewarded for his endeavour when he latched onto a long throw-in from Bowditch and half-volleyed the ball into the roof of the net to make it 4-1 in the 84th minute. Lyme completed the 5-1 scoreline when Fred Parsons was teed up by Roderiguez to lash the ball into the corner of the net with just five minutes remaining. Manager Hitchcock was delighted with his side’s second-half performance and has set his sights on a top five place in Lyme’s first ever season in Premier football. 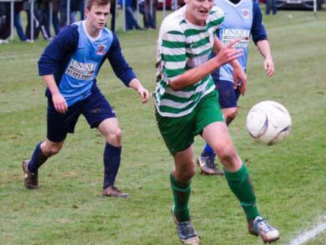 Bearpark’s second-half performance gave him the man-of-the match accolade but Wellman can also feel well satisfied with his performance as he gains in stature every game he plays for Lyme. Next Saturday Lyme are on East Devon Senior Cup duty with a home ie against Alphington 2nds (kick-off 2 pm).